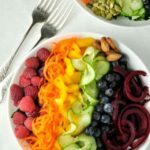 This Rainbow Detox Salad may help to cleanse your body, eliminate toxins and brighten your skin. 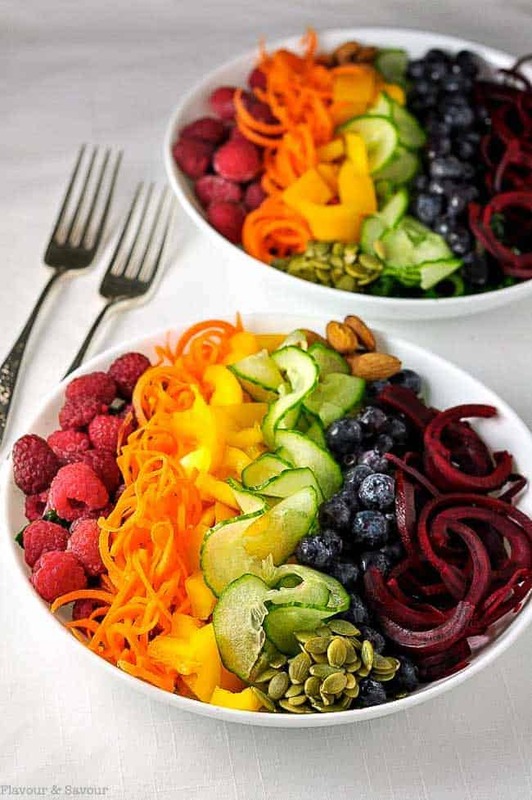 What could be better after a weekend of indulging than a fresh detox salad, full of the colours of the rainbow? 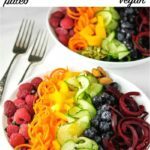 This Rainbow Detox Salad may help to cleanse your body, eliminate toxins and brighten your skin. It’s full of fresh crunchy vegetables, juicy berries, and nuts and seeds, all on a bed of healthy kale. Just as a real estate agent’s mantra is “location, location, location,” today my mantra was “presentation, presentation, presentation.” I wouldn’t have been so enthused about diving into this vegan kale salad if it was all tossed together in a bowl. Blueberries or beets staining my cucumbers? Don’t even think about it. to spiralize the beets, cucumbers and carrots, just because it’s fun. And awfully cute. Grating these veggies would be just fine too, if you don’t have a spiralizer. 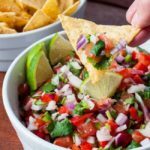 This salad is full of antioxidants, vitamins and fiber, but more importantly, it’s absolutely delicious! kale: your favourite variety. I prefer Lacinato, also known as Dinosaur kale, Black kale, or Tuscan kale, as it’s more tender when eaten raw. Start with a bed of kale. Remove the center stems. Chop the kale finely, then massage it with a teaspoon or two of olive oil and a pinch of salt to tenderize it. 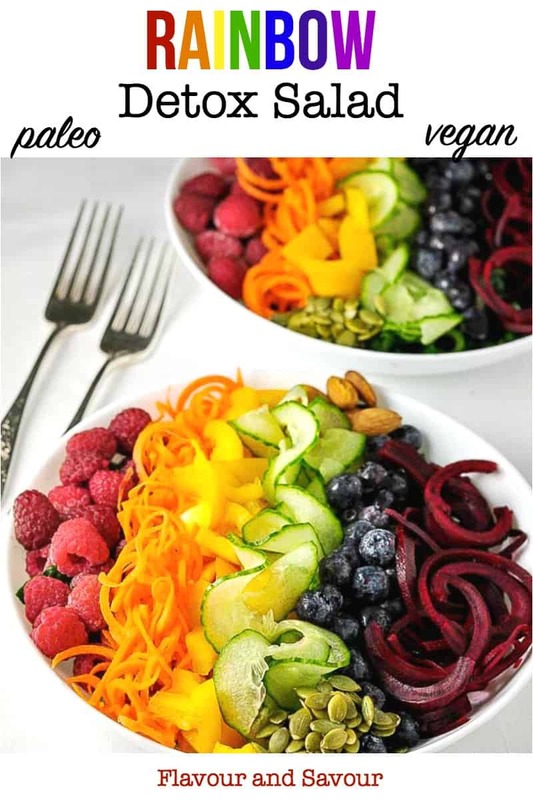 Arrange your vegetables and berries on top in rows, according to the colours of the rainbow. Add some pumpkin seeds and almonds for protein. Drizzle it all with vegan Avocado Cream and you have the makings of a beautiful healthy whole-meal salad! 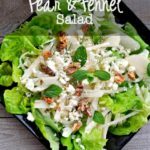 This recipe will make two large or four small salads. 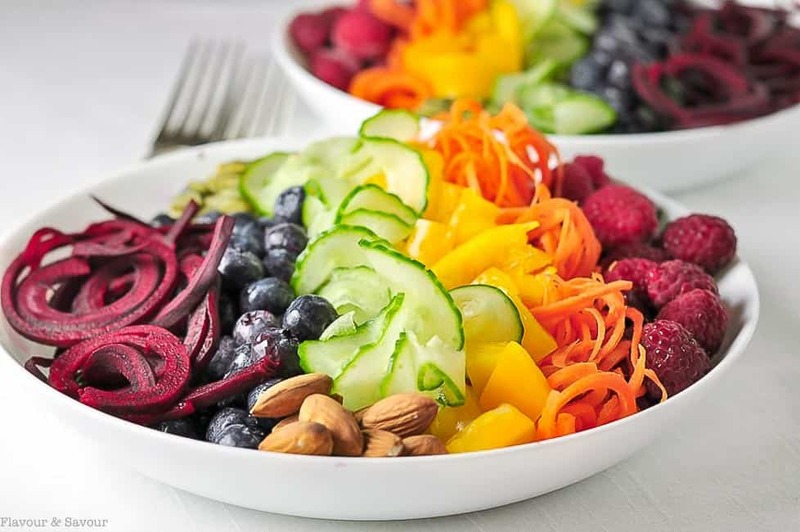 This colourful Rainbow Detox Salad is full of healthy vegetables, berries and seeds that may help to detoxify your body and brighten your skin. Put the finely chopped kale in a medium bowl, add the olive oil and salt and massage it into the leaves to tenderize. Divide the kale into 2 serving bowls. 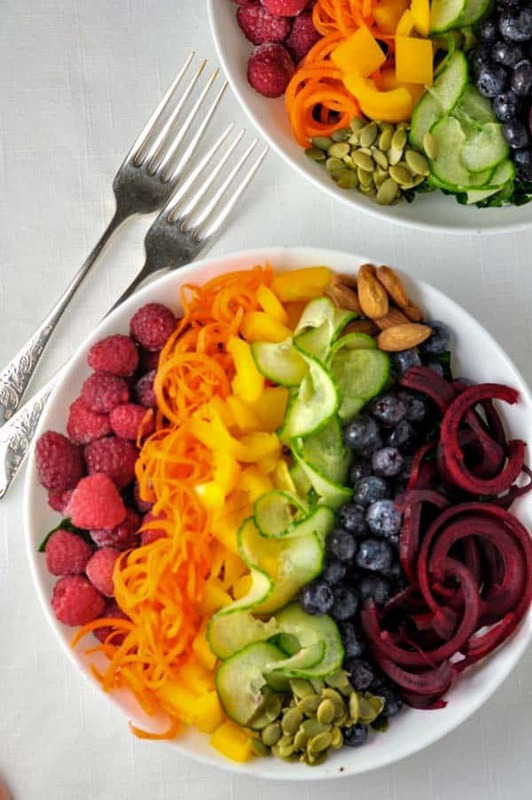 Arrange the chopped or spiralized vegetables, the berries and the nuts in a rainbow pattern on top of the kale. 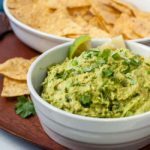 To make the avocado cream, combine all ingredients in a food processor or blender and process until smooth. Drizzle on top of the salad and serve immediately. This makes two large salads or four small. This post has been updated with new information and instructions. This salad. WOW! Gorgeous gorgeous gorgeous. I am pinning this not only for the amazing and healthy salad recipe, but for the beautiful image as well 🙂 Blessings to you! Thanks Sammi, It tastes even better than it looks! Love your site! You’re welcome. I love to sit down to a meal that looks just as good as it tastes! I see on your site that you’re training for and Ironman competition. Good luck! 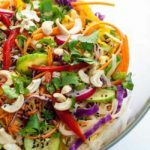 This detox salad is incredibly delicious, thank you for sharing this amazing recipe. This is so pretty! I made it on a big platter and let my guests choose what they wanted. It was a huge hit! Oh, what a great idea. I’ll bet it looked amazing! Thanks for sharing your ideas!